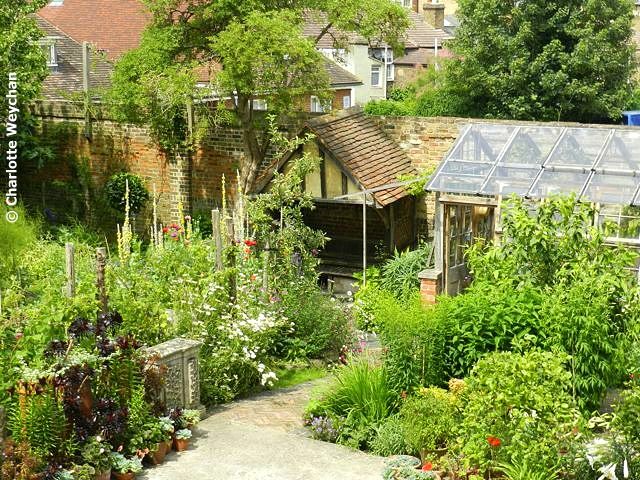 Restoration House in Rochester is one of Kent's best-kept garden secrets! It was built in 1587 - a handsome brick house at the heart of this thriving cathedral city - and it's said that Charles II stayed here on 28th May 1660 at his Restoration. Hence the name. But for garden lovers this is a hidden gem waiting to be explored, along with the rest of the city. 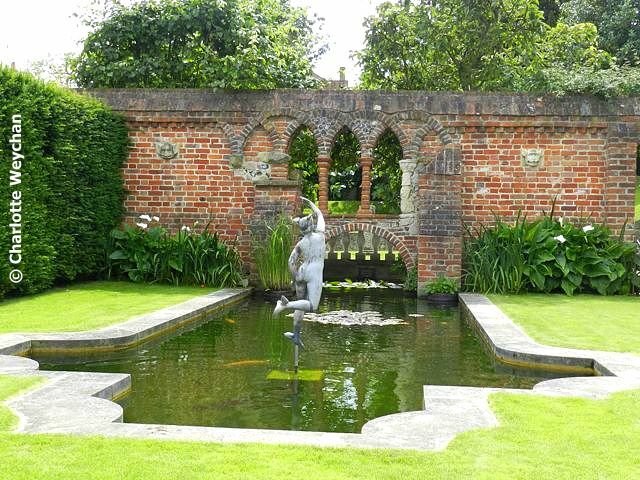 Privately owned and maintained, the garden has been open to the public since 2000 and extends to just under an acre. Restoration House is famous not just for its Royalist connections, but was also immortalised by Charles Dickens in "Great Expectations" as the Satis House where Miss Havisham lived. Little history is known about the garden, but it is the current owners who have done most of the work here. 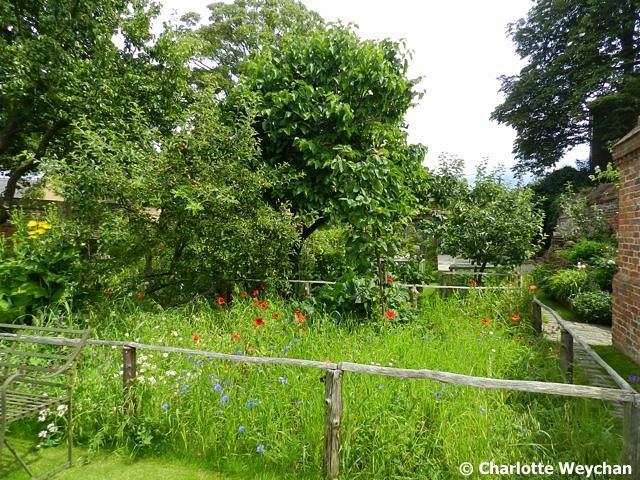 They arrived in 1994 and have created not just the magical garden at the rear of the house, but have also rescued an adjacent plot from the clutches of property developers and are planning to extend the garden. ".... continual entertainment to the eye ..."
At the rear of the house is the garden, which is divided into levels by mellow brick walls. Close to the house there are low box hedges and a network of brick and stone paths. Particularly impressive is the ornate parterre which replicates the design of the Jacobean doors at the front and rear of the house. 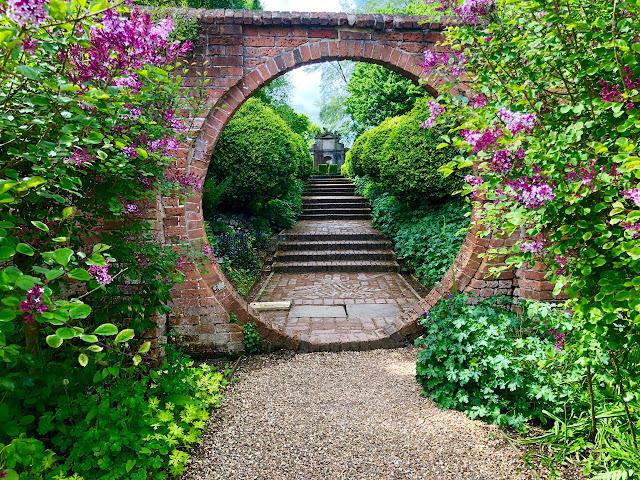 Elsewhere in the garden there are Gothic arches, an ornamental pool, well-stocked fruit, vegetable and cutting gardens and even a miniature wildflower meadow! This really is an idyllic little sanctuary within the city walls of this ancient city. 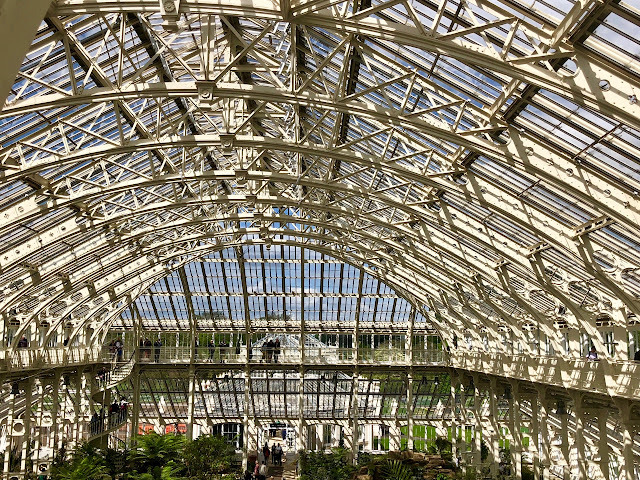 And then there are other innovations like the brick greenhouse, roofed in fishscale glass tiles which are replicas of those discovered at an ancient discovery at Heligan Gardens in Cornwall. Elsewhere there are immaculately clipped hedges and a long border filled with maturing shrubs and wonderful colourful perennials. 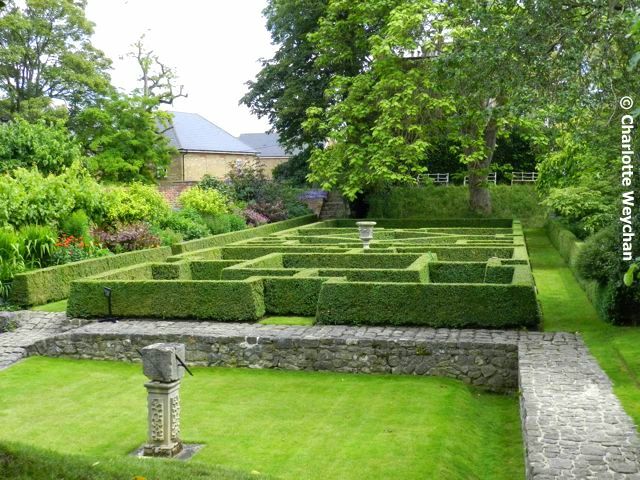 This is certainly a garden to savour and the more you look, the more detail you will see. The owners were determined to follow Batty Langley Principles of Gardening 1728 when they embarked on this project: "The end and design of a good garden is to be both profitable and delightful: where should be observed, that its parts should be always presenting new objects, which is a continual entertainment to the eye, and raises a pleasure of imagination". In 2007, the site adjacent to Restoration House was stripped in preparation for a housing development, but then a Tudor wall was brought to the notice of English Heritage and Listed Grade II, which halted the development and gave the owners of this property a chance to acquire the site. They plan to develop a further garden here once restoration of the wall has been completed, but to do this they need to raise considerable funds. But this is certainly a project to watch and if the existing garden is anything to go by, I'm sure they'll succeed. There's even a mini wildflower meadow here in the garden! It's worth making a special trip to Rochester to see this garden, and you could easily spend a whole day exploring the rest of the city, because there's plenty to see here. 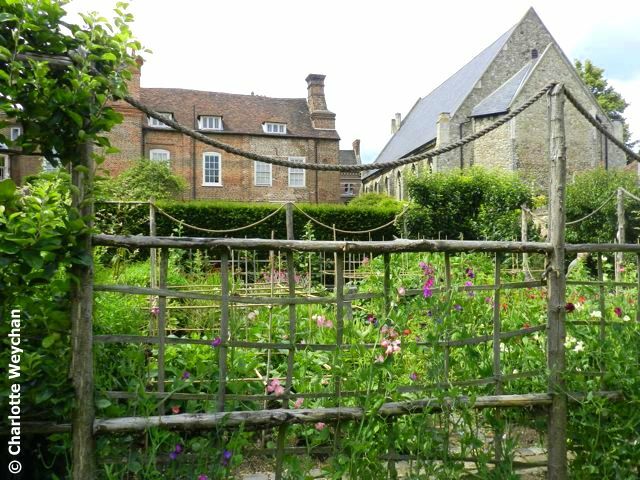 Restoration House is only open on Thursdays and Fridays (June to September) from 10.00-17.00, but if you're looking to combine it with another garden, head for The World Garden at Lullingstone Castle, which couldn't be more different! Very pretty place, a little pocket of paradise! Wonderful! The little wildflower meadow is charming... It brings childhood memories. Having a few nights in Kent next month and planning time in Rochester on way there and back. Thanks for info. on this garden as we shall be returning home Thursday so will be able to make it. Years since we have been to Rochester even though it is not far away. 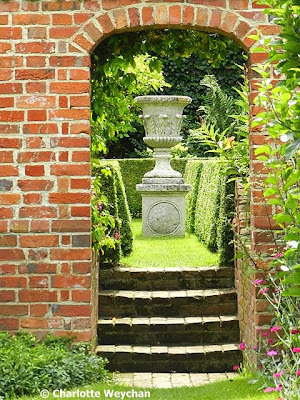 Enjoyed your Somerset gardens, the only one I know is Lytes Cary Manor. It looks lovely. My sister lives in Strood near Rochester... maybe a visit is due! This one will be on my list if I ever make it to England. It just has a certain feel that is grand, yet approachable and welcoming at the same time. Beautiful!